Me too. Tuning into political news, especially at the federal level is, in a word, exhausting. But let’s iron out what that means, because politics has a few different definitions. When we say we hate politics, we usually mean that we don’t like the politics of politics. We don’t like the power-hungry manipulation, the self-interested calculations, or the elitist stuffiness of it all. Washington, as we characterize it, has become stale with self-importance, and representatives have forgotten how dependent they are on their constituents. Public distrust in the U.S. government has declined steadily over the past 50 years. Pew Research reports that while in 1964 public trust in Washington was at 77 percent, by the end of 2017 it was at a mere 18 percent. The result today is a government with no connection or feeling of duty toward most of the electorate. The relationship has become unnaturally inverted, so that the people feel that they have to buy or earn the ear of their representatives, rather than feeling like their representatives are working to earn their trust. But if you set aside the image, the pretentiousness, and the soundbite culture around it, politics is about the people. Stripped bare, it’s about creating and realizing systems that work for its people. It forms the foundation of the rules and norms of society — which isn’t necessarily bad, except when those who control the rules and norms are power-hungry and self-serving. Even when they are well-intentioned, sometimes politicians lack the foresight to understand the long-term consequences of policy. The solution to our issue of dysfunctional government is a streamlined, decorrupted voting process through which the voices and votes of the people are valued rather than selectively suppressed, coupled with an engaged, active and educated electorate. We elect our government, and we give them their power. They depend on us, but our apathy has allowed them to forget it. A politician’s job should not be a glamorous one. It should be a role of humility and service; they must respond to the complaints and serve the wishes of their people. There’s something absurdly funny about the American myth that politicians are independently important or powerful. But while we put them in power, we’re told that our votes don’t matter. And sure, an individual vote does not control the outcome of a election. But if you don’t vote, then it’s left up to everyone who does… and unfortunately, that’s not an entirely representative sample size of our country. Before the 2006 midterm elections, Pew Research Center conducted comprehensive research on who votes and how often. Only 35 percent of eligible Americans voted regularly; 20 percent voted intermittently; 23 percent were registered but rarely voted; and 22 percent of eligible Americans were not registered to vote. Most notable from the report was the fact that when you look at non-registered Americans, 40 percent were between ages 18 and 29. That’s way more than any other age group by a huge margin — the next age group in line was 30 to 49. While this age range is twice as large, it accounts for half as many unregistered voters. These numbers should be startling and, honestly, scary. Young people have to live with the consequences of elections the longest, and are therefore affected by elections the most, but they are the most disengaged in the voting process. A June poll from the Public Religion Research Institute and The Atlantic reported that only 28 percent of young adults between 18 and 29 say they are “absolutely certain” they will vote in the 2018 midterms, compared to 74 percent of seniors. Why are we letting seniors determine our future? If just half of the unregistered young demographic voted, the political landscape would change, period. We have that power. And midterms tend to have an even weaker turnout than federal elections. The presidential election is a spectacle, focusing on entertainment more than depth, image more than authentic character, and soundbites more than comprehensive policies. The presidential election is the appointment of a figurehead, and while that’s important, local elections have a far greater concrete impact on you and your life. But this isn’t exactly an accident, and we can’t simply fault those who aren’t registered. Voter restriction has been orchestrated. The U.S. consistently has one of the lowest voter turnout rates among developed countries, partly because we have complicated the process and introduced unnecessary and often racist red tape in order to suppress voters. Instead of focusing on increasing voter turnout, legislators dedicate an absurd amount of time to creating and passing restrictive Voter ID laws, which address the non-existent issue of voter impersonation. In reality there are only a handful of documented voter fraud cases. These laws, which are passed under the guise of addressing voter fraud, disproportionately affect black and Latinx voters. That’s no accident. To highlight one such instance, Pennsylvania’s state legislature was controlled by Republicans in the run-up to the 2012 general election between Barack Obama and Mitt Romney. The Republican-controlled legislature, led by then-House Majority Leader Mike Turzai, introduced and passed strict Voter ID laws, arguing that it would combat voter fraud, even though a 2012 court filing by the state of Pennsylvania explicitly acknowledged that there “have been no investigations or prosecutions of in-person voter fraud in Pennsylvania.” It’s a laughably weak disguise. Voter ID laws address a non-existent problem. Mike Turzai leaves no room for doubt about his true intentions. As he rattled off his legislature’s accomplishments at a Republican State Committee meeting in 2012, he listed his voter ID law, which he claimed would allow Governor Romney to win the state of Pennsylvania. “Done.” He explicitly stated that the law would serve the Republican agenda by preventing Democratic voters from casting their votes. This isn’t an isolated slip of the tongue. In 2013, North Carolina GOP precinct chairman Don Yelton admitted that he wouldn’t be bothered if these voter ID laws prevented “a bunch of lazy blacks” from voting. And as a side note, while Yelton was forced to resign, Mike Turzai remains in office as Pennsylvania’s Speaker of the House today, and is up for re-election on November 6th. So voter suppression laws are actively and intentionally suppressing already marginalized groups, and these abominable intentions are only weakly disguised by their publicized goal of addressing voter fraud. Voting is difficult, and turnout is low because legislators and politicians have fought for it to be that way. A healthy democracy with the right representatives would make election day a national holiday, all citizens would be automatically registered to vote at their 18th birthday, the practice of gerrymandering would be discontinued, and early voting and mail-in voting would be simplified. Representatives would generally work to ensure that every group and every person understands how and when to vote. That shouldn’t be a tall order. Naturally, a representative’s loss of power is far less significant of a tragedy than entire populations of our citizenry being systematically and continuously silenced, right? If our democracy valued our voices, and if we exercised our right to vote, then our representatives would begin to serve our interests rather than their own. Our faith in the system would be restored, because we would see ourselves as a valued and essential part of it. Instead of our government being the enemy to fight, we would see ourselves reflected in it, and it would become the solution. This is a possibility, but we need to pay attention, we need to hold those in power accountable, and we need to vote. 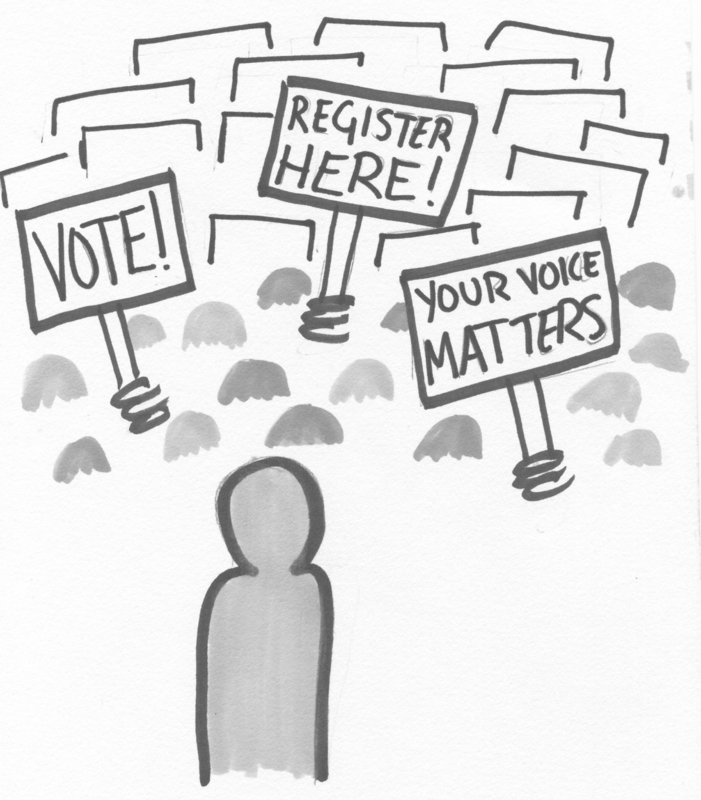 Understand the importance of your voice, and the central role you occupy in our politics. Don’t separate the country from yourself as a separate entity. You are the country. In a democracy, you are given political power, and you have a voice. Will you ignore it, or will you use it? Isabel Brooke is a third-year politics and philosophy/religion double major who is sick of watching old white men voting old white men into office.